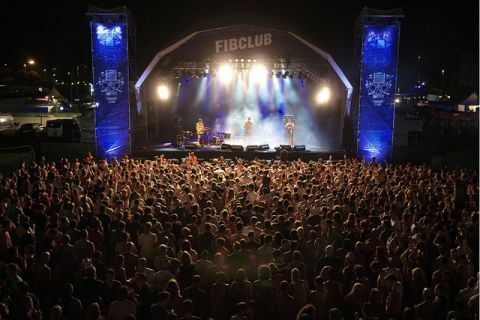 The Festival Internacional de Benicàssim (Benicàssim International Festival,commonly known as FIB) takes place in the seaside port of Benicassim. Benicassim (Castellón province) is located on the Costa del Azahar,Valencia,Spain. Valencia Airport is about 92 km away from the venue which covers an area of 120,000 square metres. Festival goers who have purchased multi-day passes can camp for up to 9 days starting Monday before the festival starts and ending the Tuesday after the festival ends. Benicassim festival has something to offer even the most diverse of musical tastes. The festival plays host to a huge selection of bands,singers,DJ's and artists encompassing genres ranging from Indie & Rock through to Dance & Electro. The Benicassim Festival has been running since 1994. In its 21 years it has pulled in increasingly big name acts including, Oasis, Kings of Leon, Paul Weller, Blur,Lou Reed,Sigur Ros, Depeche Mode, Radiohead, Kraftwerk, The Killers, Chemical Brothers, Franz Ferdinand, Oasis, The Strokes, Brian Wilson, and a lot of DJ's. The 2013 Headliners were The Killers, Arctic Monkeys QOTSA and Beady Eye. Camping is included with the festival ticket and both campsites are within walking distance of the beach and a huge water park. Florence + The Machine headed up the slew of acts for Benicassim 2015. Dizzee Rascal and Ian Brown are past performers of this great summer Festival. If you are flying into Valencia Airport,there is a special bus service running for the Benicassim Festival. The bus runs from Valencia Airport to Benicassim from Monday to Thursday every hour from 11.00hrs until 22.00hrs. The bus from Benicassim back to Valencia Airport runs on Monday 21st July from 07.00hrs to 18.00hrs and on Tuesday 22nd from 07.00hrs until 16.00hrs.